Directions: On this worksheet, you will be able to test yourself on basic principles involving sound. Question 1 A violinist and a pianist simultaneously sound notes with frequencies of 344 hz and 346 hz, respectively. How many beats will be heard by the musicians and at what pitch? Question 2 Two identical strings on different cellos are tuned to 436-hz note. The peg holding one of the strings slips, so its tension is decreased by 6.8%. What is the new frequency heard on the second cello? Question 3 At a baseball game on a cool day (air temperature of 14°C), a fan hears the crack of the bat 3.4 seconds after observing a batter hit a ball. How far is the fan from home plate? Question 4 A person holds a rifle horizontally and fires at target. The bullet has a muzzle velocity of 505 m/s, and the person hears the bullet strike the target 3.4 seconds after firing it. The air temperature is 14°C. What is the distance to the target? Question 5 A sound wave with a frequency of 14 hz is in what region of the sound spectrum? Question 6 You are watching a distant neighbor re-roof his house one cold morning when the air temperature is 14ºC. As you watch, he pounds a roofing nail at a regular interval of 2 times each second. You hear the sound of the blows exactly synchronized with the blows you see. After he stops hammering, you hear 4 more blows, how far away is the neighbor's roof from your window? Question 7 The driver of a 18-wheeler parked on a desert highway gives his truck's horn a quick blast toward a rocky messa that is 1.3 kilometers away. If he hears an echo 7.4 seconds later, what is the approximate air temperature at his location? Question 8 A ship surveying the ocean bottom sends sonar waves straight down into the sea water from the surface. 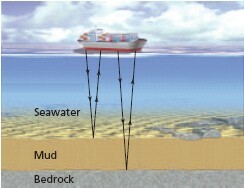 The first reflection off the mud surface at the sea floor occurs 1.83 seconds after it was sent; while the second reflection off the bedrock at the bottom of the mud layer is received after 2.56 seconds. If the speed of sound in sea water is 1525 m/sec and the speed of sound in mud is 1879 m/sec, then how thick is the mud layer?